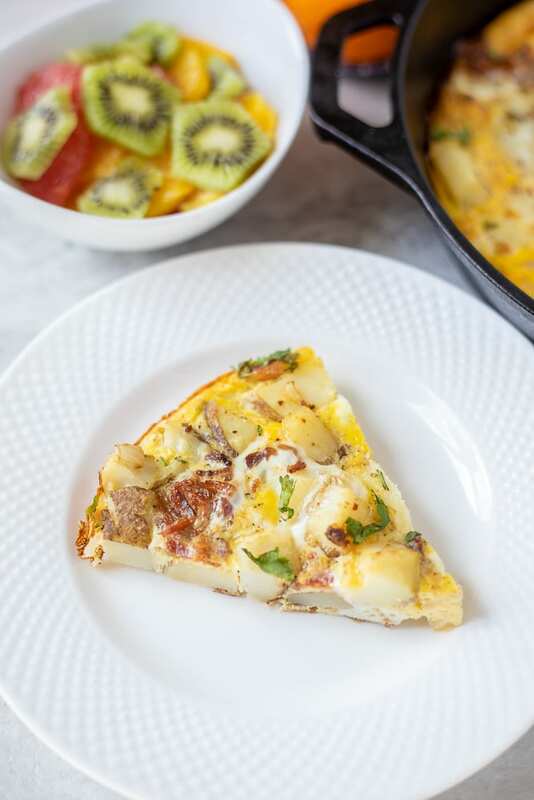 This Potato Frittata is a delicious and easy recipe for an oven baked frittata. 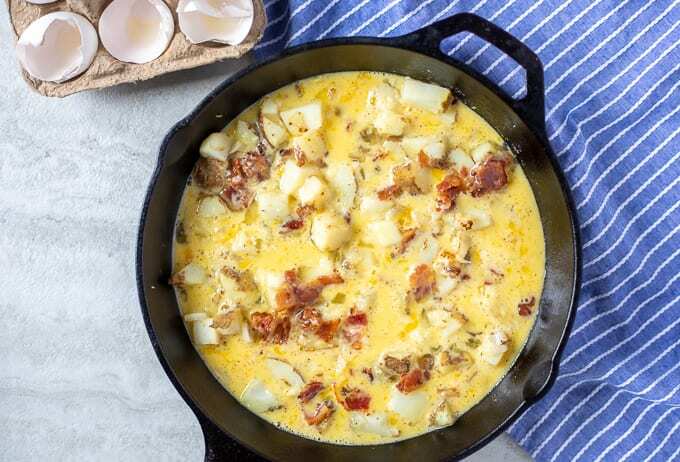 Potatoes and leeks are pan fried with a bit of bacon and then baked with a creamy egg custard for a hearty, gluten-free meal perfect for brunch or breakfast. If you are looking for a different spin on a frittata, you may enjoy Mediterranean Frittata or Asparagus Frittata. Be sure to also check out my collection of Easy Healthy Breakfast Recipes for more breakfast and brunch inspiration. One of my favorite breakfast recipes is a frittata. Oven baked frittatas can be made in a variety of different ways, are incredibly inexpensive, and can be made to accommodate food allergies and sensitivities. Plus, frittatas are full of protein–which keeps me and my family going strong all morning long. Potatoes make a great addition for frittatas. They help to bulk up a frittata, while still keeping this dish gluten free. And when pan-fried, as the potatoes are for this Oven Frittata, they add a crispy element. From the crispy salty bacon, to the tender hearty potatoes, these simple flavors win everyone over. And I love this Oven Frittata because not only does it please my family, it is easy to make! Drain off water from leeks and rinse well. Chop leeks on CLEAN cutting board–that is key! Make sure you don’t use the same cutting board as when you sliced the leeks open, or you will surely end up with dirt or sand in your chopped leeks. 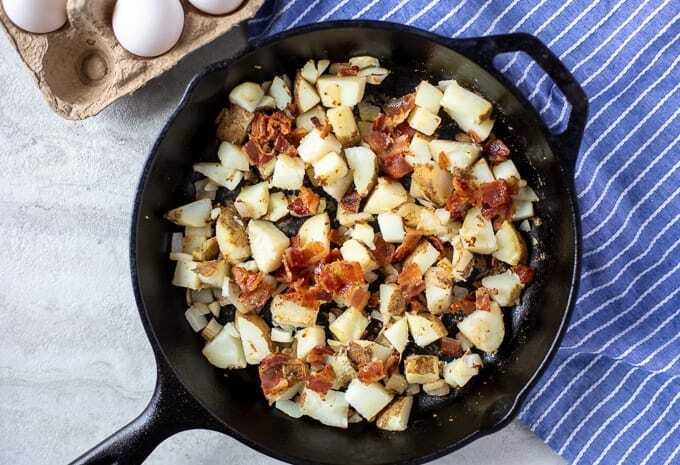 In a cast iron skillet, or oven safe frying pan, pan fry bacon over medium heat, until crisp tender. Remove bacon from skillet and place on plate lined with paper towel. Drain all but 1 tablespoon of bacon grease from the skillet. Once bacon is cool enough to handle, crumble bacon into small pieces. Chop scrubbed potatoes into 1/2 inch cubes. Add potatoes to bacon drippings and cook over medium heat for 5 minutes per side. Add in onions or leeks and cook until potatoes are crisp and tender, being sure to stir every couple minutes. Sprinkle bacon over potatoes and leeks. Turn heat off on skillet. Whisk together eggs, milk, salt, pepper, and cheese. Pour egg mixture over potatoes and bacon. Bake Frittata until eggs are set. This Potato Leek Frittata is delicious without bacon. Simple use 1 tablespoon canola oil in place of the bacon drippings to pan fry the potatoes. One of my favorite hacks to speeding up the process of making this easy oven baked frittata is to use leftover baked potatoes. Simply cube up cold baked potatoes. Saute potatoes in bacon drippings or oil just until outside of potatoes are crispy. Drain off excess grease or oil. Proceed with recipe as stated. Leeks are a delicious mild variety of onions. However, they do take a bit more time to prepare AND you may be less likely to have them in your kitchen. So if that is the case, feel free to use minced yellow onion in the place of leeks. Potatoes and leeks are pan fried with a bit of bacon and then baked with a creamy egg custard for a hearty, gluten-free meal perfect for brunch or breakfast. In an oven safe skillet or cast iron pan, pan fry bacon over medium heat until crisp tender, turning bacon after about 5 minutes on the first side. Once bacon is crisp, remove bacon and place on plate lined with paper towel. Drain off all but 1 tablespoon bacon grease. Add potatoes to bacon grease and lightly season with salt and pepper (if using canola oil instead of bacon grease, the potatoes may need a bit more salt). Pan fry for 5 minutes, stirring frequently. Add in leeks/onions and continue to pan fry for another 5 minutes or until potatoes are fork tender. Turn off heat on skillet. Crumble cooked bacon evenly over potatoes. Whisk together eggs, milk, salt, pepper, dash of nutmeg, and Parmesan Cheese. Pour egg mixture over potatoes and bacon. Bake for 10-15 minutes, or until eggs are set. If omitting bacon, use 1 tablespoon canola oil to pan fry the potatoes. Feel free to use any cheese in place of Parmesan. Onions can be substituted for the leeks. If you do not have fresh nutmeg, just omit from egg mixture. What a kind neighbor! That would definitely make me feel welcomed! You’re making me hungry with this fritatta btw – love the sound of the nutmeg added in too! Thanks Sarah! I have been so blessed with great neighbors! LOL–well, live and learn and do as they do in Madrid–what a great opportunity to travel there! Your neighbors sound amazing! What a great use of leeks and hopefully you now LOVE leeks! This is such a great brunch dish! I do, I tried them and I like them..hee, hee! And I have the best neighbors! How sweet of your neighbours to do that. 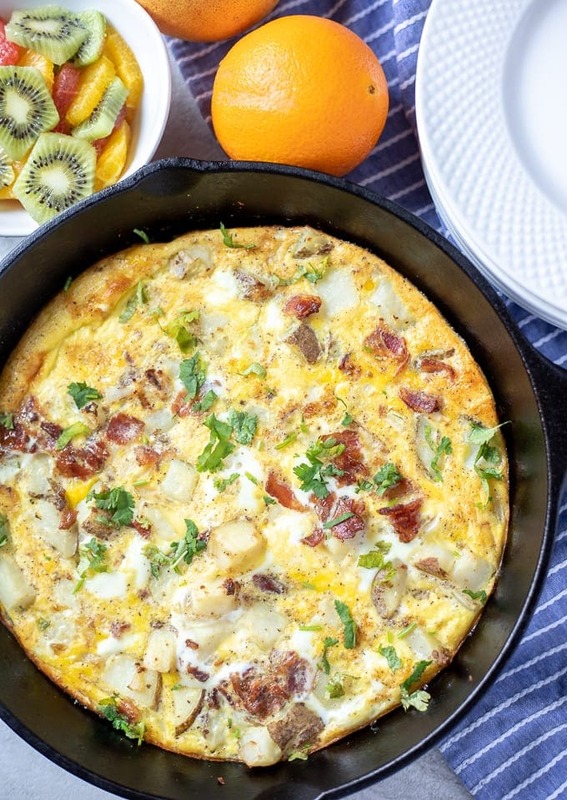 I love the flavors in this frittata – it looks perfect for a great breakfast! I am so blessed with WONDERFUL neighbors! Yum! This sounds delicious. I love eggs and potatoes. I know what you mean about leeks, I soak them for a while after slicing them to get all of the grit out. Thanks for sharing! What a delectable way to make breakfast or brunch special! Thanks for sharing your healthy and delicious roasted potato and leek fritata with us on the Healthy Happy Green and Natural Party Blog Hop. I’m pinning and sharing. It is a great way to make breakfast special.